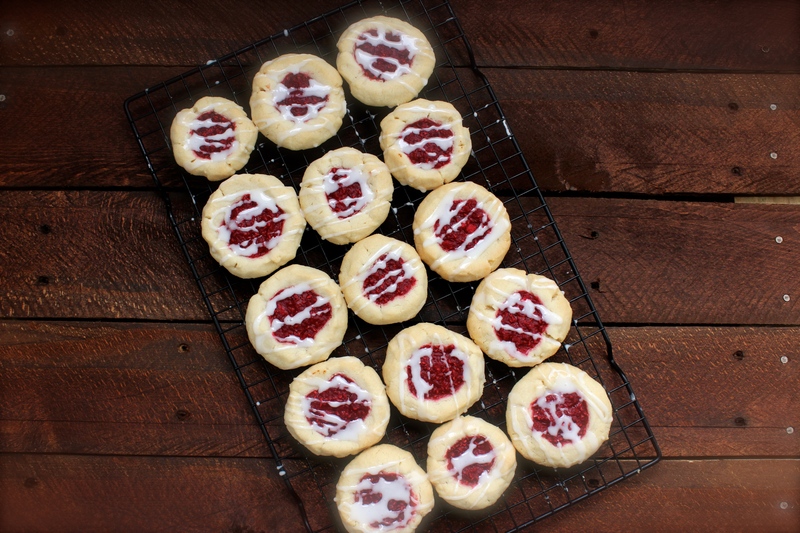 These buttery thumbprint cookies are to indulge on! They are truly more amazing then words or pictures can describe. I never dreamed that such a simple, basic recipe could result in such a sophisticated flavor. Your husband will be under the false impression that you’ve spent hours on these babies when in reality they were whipped up before the first song was over but thats okay. My little foodie could hardly wait for them to cool before digging in. Its unbelievable how he instinctively knows when something is sweet! Declan helps me with everything, from rinsing the dishes (AKA playing in the water and turning the floor into a slip danger zone) to flipping the mixer switch to high speed, sending flour to the outer corners of my kitchen. If your recipe doesn’t turn out to be quite like my picture, maybe its because you have more flour in your dough than I did! =) Thanks to my over-enthusiastic helper. We’re in this food thing together. In mixing bowl, whip butter until creamy, about 1 minute. Add sugar and flavorings. Beat again. Slowly add flour and mix just until combined. Cover with plastic wrap and refrigerate for at least 30 minutes or until dough is workable with hands. Roll into small balls and place on greased cookie sheets. Make an indentation with your thumb into each ball. The dough may crack slightly when you press your thumb into it. Simply smooth it out with your fingers if you can. 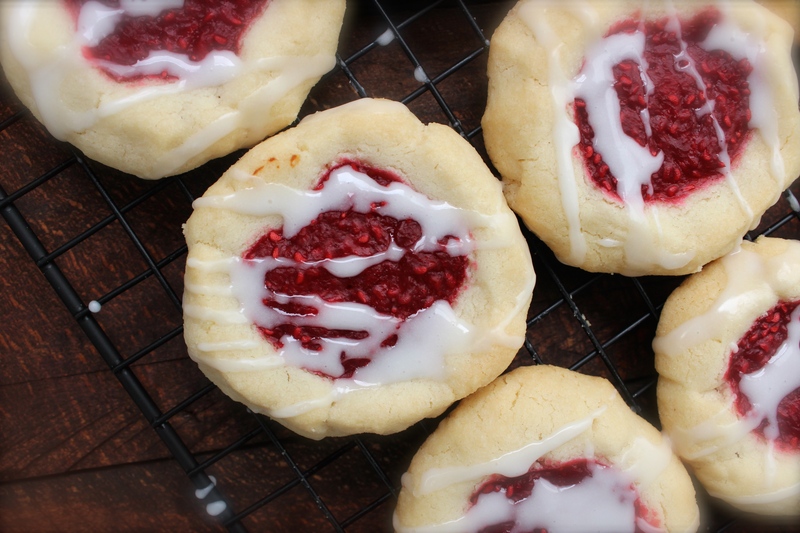 Fill each thumbprint center with raspberry jam. Bake the cookies for 14-15 minutes, or until very lightly browned on the edges. The cookies will puff up and spread slightly. Do not overbake. Cool for at least 30 minutes before glazing. Make the glaze: stir together glaze ingredients until smooth. Add more liquid to thin out or add more confectioners’ sugar to thicken to your desired consistency. Drizzle over cooled cookies. Glaze will set within a couple hours.